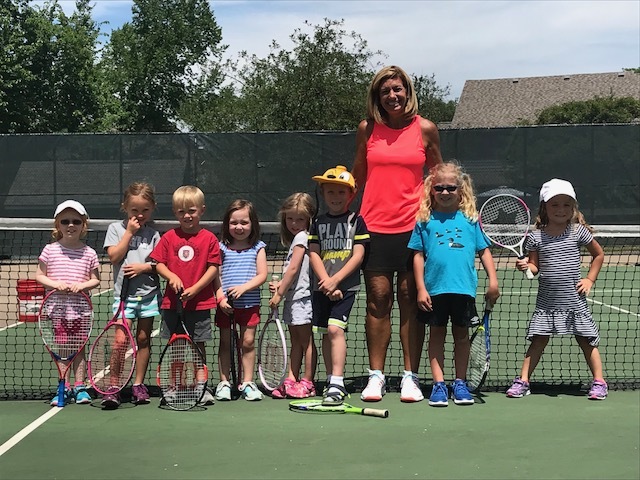 Muirfield kids are having a great time at the tennis courts this summer and there is still time to join in the fun! The final Junior Tennis session starts next Tuesday, July 31 and runs through August 9. Tiny Tots (Ages 4 - 5): Introducing the youngest to tennis! Smaller racquets and foam balls. They will be taught the fundamentals of the sport along with developing their overall hand-eye coordination. Classes are Tuesday, Wednesday and Thursday, 12:30 - 1:00 pm, $55/session. Big Shots (Ages 6 - 8): This is a beginning class for students who have had no or little exposure to tennis. The class will teach beginning strokes, introducing forehand, backhand and volleys. Modified point play and games to promote the love of the game. Classes are Tuesday, Wednesday and Thursday, 1:00 - 2:00 pm, $85/session. Future Stars (Ages 8+): This is for the child who has had some lessons and is an advanced beginner. Good for a beginner 10-12 year old or an advanced 8 and up child. The class will work on ground strokes, volleys, serves and introduce point play. Classes are Tuesday, Wednesday and Thursday, 2:00 - 3:00 pm, $85/session. Kids Night (Ages 6-10): Perfect for working parents who want their kids to experience tennis! This is a drop in class. No sign up - come when you can! This class covers the basics of tennis. Learn ground strokes, volleys and play games. The final Kids Nights will be July 31 and August 14, 6:00 - 7:00 pm, $15/class. Junior Excellence 1 (Middle and High School Players): This is for the intermediate to advanced middle and high school players. Classes are Tuesday and Thursday, 2:00 - 3:30 pm, $85/session. If you have questions, contact Carrie Smith at 614-264-9661 or email [email protected]. Read more about Junior tennis programs.